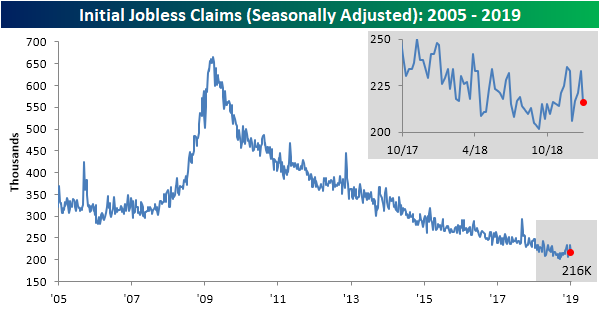 This week’s jobless claims data is piggybacking off the strong readings from Friday’s Nonfarm Payrolls report. 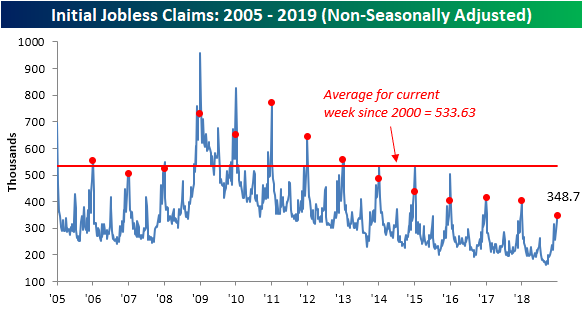 Claims for the past week came in at 216K; well below last week’s revised 233K. Forecasts were calling for this drop, though claims were expected to come in 10K higher at 226K. This 216K reading is still off of lows from September but builds the streak of coming in at or under 250K to 66 weeks. This week also marked the 201st week with claims under 300K. On a four-week moving average basis, claims saw a slight uptick as the low 206K reading from the first week of December has rolled off. The moving average currently sits at 221.75K (up from last week’s 219.25K). While still very low by historical standards, claims seem to have bottomed out some weeks ago, and on a shorter time horizon remain somewhat elevated. Turning to the non-seasonally adjusted reading is perhaps the most impressive measure of this week’s data. Claims did, in fact, see a sizeable jump in line with seasonal patterns, but in spite of this rise, claims are still significantly lower than prior years in regards to the current week of the year. At 348.7K, non-seasonally adjusted claims are far below the 533.63K average dating back to 2000. If this week turns out to be the seasonal peak of the year, which is fairly likely based on historical trends, it is the best reading in years. 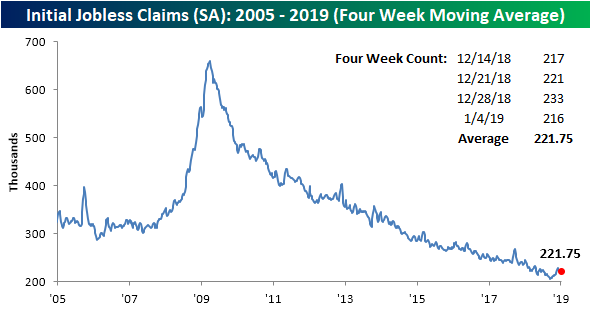 There is still a chance claims can tick higher next week, but even if that uptick happens, this week’s reading only echoes last week’s Nonfarm Payrolls and showcases an enduring and historically hot labor market.